BANNING, Calif., Sept. 13, 2018 (GLOBE NEWSWIRE) — Pardee Homes Inland Empire announced today that development is underway at Atwell, the first master-planned community to rise in Banning in more than two decades. Phase one of development consists of 480 home sites, two commercial retail pads and one K-6 school site. 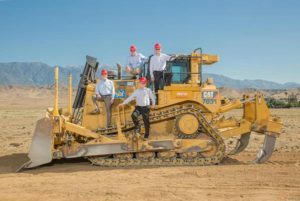 The entire master-planned community of Atwell in Riverside County will span 1,528 acres and is slated for more than 4,400 single-family homes across approximately 40 neighborhoods. The architecture for the homes is in its preliminary stages, with various elevations anticipated, including Craftsman, Spanish and Italian, with square footage expected to range from 1,800 to 2,600 square feet. Model homes are anticipated to open in January 2020 with first occupancies slated for May 2020. Located at the base of the San Bernardino Mountains with views of the adjacent San Jacinto Mountains, Atwell is characterized by its scenic surroundings. The historic Smith Creek winds through the community with natural open spaces highlighting foliage indigenous to the area. The master plan is being designed to accommodate residents’ health-focused lifestyles. While specific amenities are still in the planning stages, some of the features the builder anticipates including at the community consist of pathways and playgrounds as well as approximately eight pools upon completion. Activity centers are also anticipated that would include a 3,500-square-foot recreation center with a large pool, tot lot, meeting rooms, kitchenette and barbeque area. A scenic-rich trail system spanning roughly eight miles will be open to the public at build-out. Atwell not only offers residents rich design and wellness aesthetics, but also a convenient location. The site is strategically located near Interstate 10 in the San Gorgonio Pass, roughly 80 miles east of Los Angeles and 25 miles northwest of Palm Springs. Public bus routes will be incorporated throughout the community, along with carpool and rideshare parking lots. The community will be serviced primarily by the Beaumont Unified School District, with Banning Unified School District encompassing approximately 700 homes. Pardee Homes Inland Empire designs and builds new homes and communities for first-time to luxury homebuyers. Established in 1921, Pardee Homes Inland Empire is accomplished in the planning and development of master-planned communities, green homebuilding measures, environmentally sensitive development practices, and customer-focused processes for new home purchases, and is also widely known for its steadfast civic outreach. Pardee Homes Inland Empire was recognized as 2017 Builder of the Year by the Building Industry Association of Southern California – Riverside County Chapter. Pardee Homes is a member of TRI Pointe Group®, a family of premium regional homebuilders. For more information about Pardee Homes Inland Empire, please visit www.PardeeHomes.com/Region/Inland-Empire.